It takes a lot of work to make a market run. It wouldn’t be possible without the support and aid of our dedicated volunteers and loving community. We are looking to collaborate with a group or just a few dedicated volunteers to help run the Power of Produce Club. Every other week we have children’s educational activities and are looking for help running this program during markets. It takes a lot of work to set up a market every morning – setting up tents, booths, stage and music equipment, barricades, and tables and chairs for our cafe as well as putting up signs trash stations and more. Then we break it all down again at the end of the day and put it back in our storage container. A good level of fitness is recommended – hauling and moving equipment can be heavy. A good opportunity for community service hours for school or church groups. 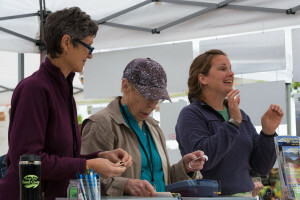 Volunteers in our information and mercantile booths provide general market information (market hours, restrooms, etc.) to customers, provide information about Anacortes for visitors, sell merchandise, and may assist with occasional surveys and other small tasks. 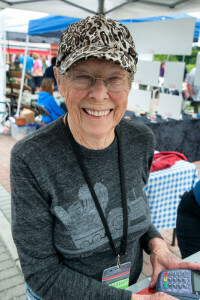 Market day volunteers should be prepared for all weather – dress in layers! We list things here from time to time to ask the community for help on a project. It’s a great way to help out if you can’t volunteer or donate. Businesses can help too! Often the equipment we need can be found in the back room or scratch and dent pile. Or perhaps you see an opportunity to help that we haven’t even thought of !